Autobot Throttle has a power source that boosts the speed of Autobot Breakaway enough to make him uncatchable! Getaway is a character I never even knew existed until 2007. When the live action movie arrived in theaters, new Transformers toys flooded the aisles. Along with the movie line and Classics line, Walmart carried some Classics-styled figures that were repaints of figures that came out during the Unicron trilogy. This exclusive line gave birth to a repainted Excellion figure into a new version of Getaway (the first since 1988!!! ), which was named Breakaway – that particular figure was gifted to me by my wife, a random present that didn’t have any holiday or birthday tagged to it. Ever since, I’ve had a soft spot in my heart for Getaway, so when a Titans Return version was announced, purchasing Getaway was a no-brainer for me. Getaway’s original incarnation was a Powermaster toy debuting in 1988, which didn’t include any cartoon appearances. However, he lived on in several comic lines, beginning with the initial Marvel continuity. Most recently, Getaway had some ‘page time’ in More Than Meets The Eye, which is probably what most people would have recognized him from, myself included. Pegged as a cunning and exceptionally skilled escape artist, Getaway is also quite manipulative, and can typically coerce most bots into doing what he wants. While that’s not exactly the most honorable character trait, it’s at least a little more interesting as it comes from the fairly noble Autobot ranks. I appreciate the character (even though his history isn’t very rich) and I also appreciate Hasbro taking a second crack at an updated version of a minor character (even though he is a repaint, again). 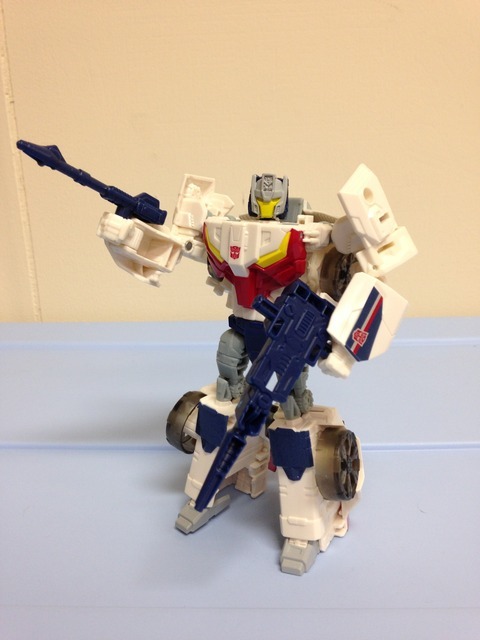 Getaway is once again partnered with Rev, though in the form of a Headmaster instead of a Powermaster. Getaway is a direct repaint of Titans Return Chromedome, albeit with a new Titan Master. As far as I can tell, everything is exactly the same, save for the molded plastic colors and paints/tampos. That means that Getaway, like Chromedome, has an alternate mode that is a nondescript futuristic car. For being ‘futuristic’, that car design surely is boxy! I always envisioned futuristic things to be sleek and aerodynamic, but Transformers consistently bucks that trend by making things boxy and angled. The car mode itself is quite nice though, and the coloration is more pleasing to the eye than Chromedome’s brown (in my opinion). 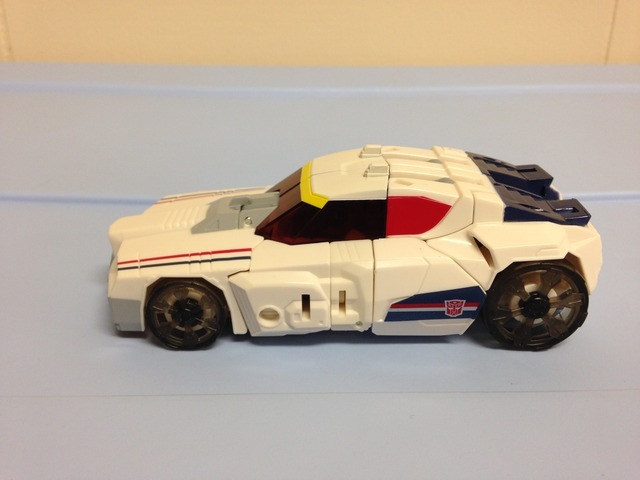 While the mold itself looks nothing like the original toy, the paint apps and such have been done in the original’s style, right down to the red windshield with the yellow stripe and the blue on the back end of the car. The entirety of the car is molded white plastic, but there are some blue, red, and silver detailing on the sides and hood that give the impression of the original car. The bumper is done in light grey, as is the faux motor poking out of the top of the hood. It’s not quite like the original Powermaster, but at least it’s a nod in that direction. Finally, the wheels are oddly done in a transparent smoky grey, which is slightly odd but not a deal breaker. Overall, the look of the car is fairly well done, even if the design isn’t spot on to the original. Aesthetically, the only thing that irks me is the back half of the side windows – they’re painted red (which is nice in a way), but the remainder of the windows/windshield is transparent red, so the look is a little off-putting. Getaway’s car mode has a couple fun features, but nothing truly noteworthy. The ‘cockpit’ of the car can open up to house Rev as a driver (or any other Titan Master for that matter), but it’s challenging to open – you really need to shift open an arm to get at it, otherwise you’ll need some good fingernails to get underneath the tight edges to open it up. I wish there was a way to open it easier, so it’s sad that a main play feature is hindered like this. Comparing the design to something like Getaway’s wavemate TR Hot Rod, which has a tiny tab on the front of the windshield, makes this all the more frustrating. Aside from a Titan Master driver, the larger of the two guns can be tabbed into the roof of the car, allowing for a Titan Master to sit in, while the smaller gun also pegs into it for some double-blasting run-and-gun driving. Alternatively, the guns can be pegged into the sides of the car via 5 mm peg holes. The overriding factor here is that, while the car mode is not perfect by any means, it has enough play features and resembles the original enough that it works for what it is. It doesn’t knock down the figure any, but definitely doesn’t do anything to make Getaway a surefire purchase. Getaway’s transformation scheme is easy, but nothing that hasn’t been done before. Honestly, if you own any version of the Combiner Wars Dead End/Streetwise mold, you’ve seen the entire thing before. And obviously as a direct repaint of Chromedome, the same transformation can be found here. There’s a simple matter of opening the arms to get to opening the cockpit, which shifts the latter onto the back of the car. The legs open, swing down and reclose, then a twist of the waist puts the legs into proper position. The hood can then be hinged onto the back, and the chest plate flipped down. Add the head and Getaway is good to go. Getaway’s robot mode, much like his car mode, is not a close representation of the original toy. However, there is enough paint applications around in the right places to make the right impression. The original toy featured the windshield on his chest, but the chest plate takes that spot with the Titans Return version, and it’s painted red with a yellow stripe to mimic the original. Likewise, the knees are painted blue to mimic the original’s spoiler, and the shoulders have enough height to them to mimic the original’s wing-like shoulder pads. The rest of the robot mode follows suit, with a blue waist and grey upper legs (the thighs/knees are actually the same pieces from TR Blurr/Brainstorm), and a head designed to appear like the original toy (more on that later). The one sad omission is that the arms are bland white like the rest of the molded plastic, but the original’s coloration was done in blue. Had the arms been painted blue, I think the figure would really pop on the shelf and honestly it would not have taken much more paint - that color was already used on the knees! Aside from coloration, the molded detail (while not accurate to the original) is done rather well, and there aren’t many blank spots to be seen. As mentioned previously, the head design is done in the spirit of the original toy, with a light grey ‘helmet’ and yellow facemask. Also like the original, you’ll find bland yellow eyes, which I am not a fan of. A tiny bit of light blue paint would have gone the extra mile and been a tiny representation of the recent IDW design – a missed aspect that I think would have significantly enhanced Getaway’s appearance. Additionally as seen with other Titans Return heads, the boxy shape of the TM robot pokes out from behind semi-rounded faces, and Getaway is no different. In the articulation department, Getaway is pretty standard. There’s quite a few swivel, hinge, and ball joints around that give a good range of motion. Nothing is really hindered save for the backs of the calves – those are a bit big due to the windshield’s presence, but it’s not so bad as to kill the figure’s movement. The rest of the figure is open to a great deal of dynamic positioning, which is suitable for an escape artist. 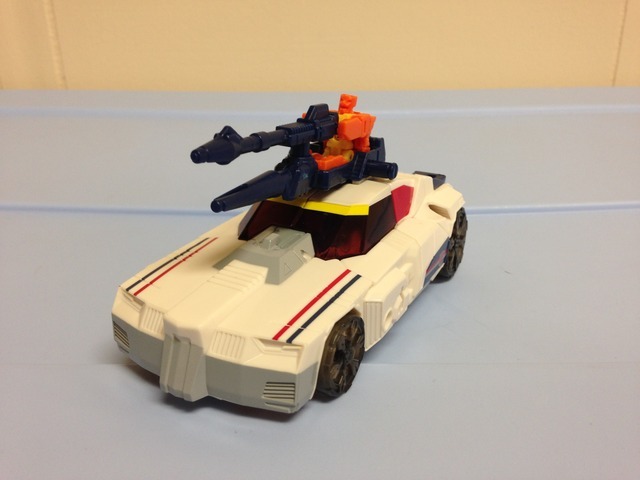 Getaway comes with two guns that I previously mentioned in the alt mode section – they can be dual wielded or combined for one double blaster. Either display will work just fine, and I don’t see a true benefit choosing one over the other. In the end, Getaway may not be the perfect representation of his namesake toy (much like the car mode) but there really isn’t anything here to diminish the toy’s value. 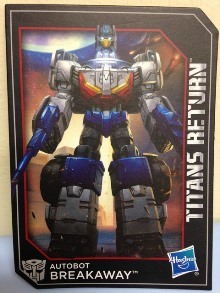 Rev is actually a repaint of Teslor (Arcana) from TR Brainstorm, with the exception of Getaway's face on his back. The entire Titan Master’s robot body was re-purposed for Rev, which is kind of sad. I don’t know of any other instances like this in the TR line (save for the individual Titan Masters that are being repainted at an alarming rate), and I believe every Deluxe class and up figure has gotten his own little unique partner. The other bummer with Rev is that he is not at all colored like his original incarnation – that one had a grey body with maroon legs and arms. This could have easily been done as it wouldn’t require any paint at all, just the right colored plastic. 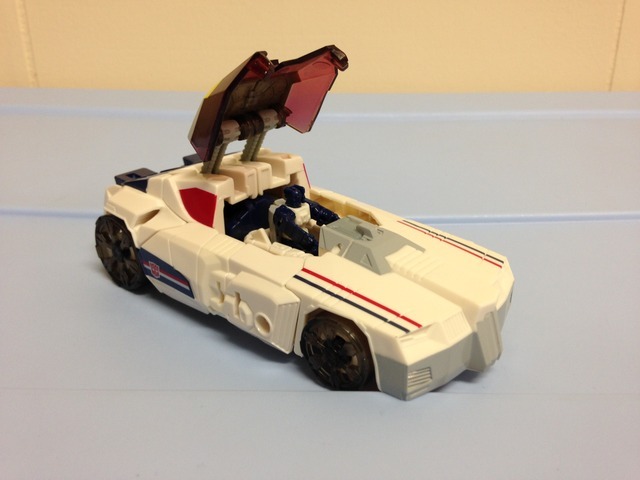 This is another one of those moments that would have really helped Getaway be properly represented, and Hasbro decided to take a shortcut – there’s really no reason for it. In the end, Rev is just your standard Titan Master that could have been so much more. Transformation Design: 5/10. Simple and fairly standard for a few years now if you’ve owned similar car Transformers in this size class. Durability: 9/10. I can’t really find anything that would break on Getaway – everything is solid all around. Fun: 6/10. Getaway is OK. I would really like to score this higher, but he doesn’t have the fun features like some of the other Titans Return Deluxes (like Hardhead, Triggerhappy, or Weirdwolf). Aesthetics: 7/10. There’s good paint here, but there’s also too much flat white to make him look good. Light blue eyes would have been fantastic, as would a properly colored Rev. Articulation: 8/10. Pretty good joints and range of movement, nothing is hindered beyond salvation. Value/Price: 8/10. I was able to nab Getaway for $10 USD – about 66% of the normal MSRP. I think that’s pretty decent for a solid figure of a character I like, but at an MSRP of $15, this one would not be recommended. Overall: 6/10. I like Getaway. I really do. There are some aspects of Getaway that are desired – good range of motion, simple to transform, and fun TM interactions, to name a few. I like Hasbro’s effort to bring back a minor character, but there are way too many design/aethetic bits that were missed, and those drag him down. I’m not displeased that I got Getaway for the price I paid, and he is really solid… but there is nothing here that suggests you need to have this figure.